Tuition: Tuition includes the cost of attending classes. This varies by school and also depends on how many courses and credits a student takes. Other institution-related fees: Most colleges also charge quarterly or annual fees that cover student services such as the library, athletics, and campus maintenance. Room and board: Room and board fees include the cost for housing and meals (usually on campus). These vary by school and region. Books and supplies: Most students need to purchase books during their college career. They also need to pay for basic school supplies and equipment (backpack, folders, pens, etc.). Some of these, such as graphing calculators and computers, can be expensive. While they may not be required to purchase them, many students find that it’s more convenient and efficient to own their own laptop or computer so they don’t have to borrow one or work around library hours. Living and transportation: Students living off campus and not living at home will have to think about paying rent. Whether you live off campus or in a dorm room, you might want to purchase household items like furniture and kitchen appliances. Students may also have vehicles that need gas and routine maintenance, or they may need to purchase passes for public transportation. Personal needs and entertainment: Students will need to pay for personal items such as clothing, toiletries, etc. They will also probably want to spend money on recreational activities, going out with friends, and so on. College students are often aware of room and board expenses but may forget to factor in the cost of necessities like furniture, kitchen appliances, and other household items for their dorm or apartment. Student loans: Students can apply for subsidized or unsubsidized loans through the government. Your college determines the amount of each type of loan offered to you. Subsidized loans allow you to defer payment until six months after your graduate, while unsubsidized loans still accrue interest while you’re in college. 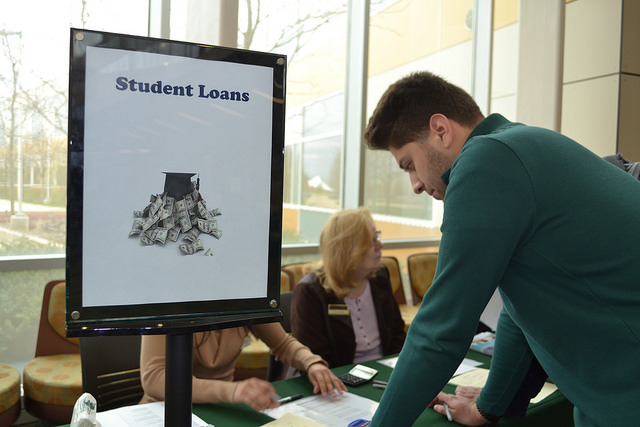 Students may also obtain private loans through their banks. However, these types of loans are typically subject to more interest. Check the U.S. Department of Education site for information on applying for different types of loans. Grants and scholarships: Grants and scholarships do not need to be paid back. Student can look for grant and scholarship options through the government, their schools, and their communities. They may be awarded on the basis of financial need, academic merit, or talent. You can visit your guidance counselor or financial aid office for listings of available grants and scholarships, or conduct independent research at sites like College Scholarships. Jobs: There are a number of paid work opportunities for college students, ranging from work study to on- and off-campus jobs and internships. If you have the time to commit to working while you’re in school, it’s worth investigating all of them. The topic of student job opportunities is covered at length later in this module. Identify the college expenses you will need to cover. Research the college you attend and identify any additional costs that may be unique to that institution. Review resources that may help you pay for college in the “Financial Resources” section. Applying for financial aid requires planning and organization. Below are steps you can take to increase your chances of getting help paying for college. This free application asks students questions about their background, personal finances, and college, and provides information about what loans, work study, and other types of aid they might be eligible for. You may be unaware of factors that affect how much financial assistance you are eligible for, such as changes to your parents’ income or your job status, or having a sibling start college. This is why it is important to fill out a new FAFSA application annually. Although it can be a chore to track down exact amounts—and so much easier to estimate things like your parents’ or your income—failure to provide accurate numbers can mean that you may not qualify for all the financial assistance for which you’re eligible. Before you fill out the FAFSA form, be sure you have collected and have handy all the important information you’ll need. This includes your (and your parents’) tax forms, social security number, and income statements. The U.S. Department of Education’s Site for Federal Student Aid has more tips on how to effectively fill out your application. If you’re still in high school or you recently graduated, ask your guidance counselor about grants and scholarships you could apply for. Your college will also be a good resource, since most institutions have their own scholarships and awards that are available to their students. Check to see if your employer, place of worship, clubs, or volunteer organizations have any grant or scholarship opportunities. Although these sources may not offer as much as federal loans or college scholarships, they may help you cover the costs of books and/or supplies. Whether you’re filling out the Free Application for Student Aid (FAFSA) or applying for scholarships, most organizations will have deadlines. These deadlines help ensure that if you are eligible, you will receive your financial assistance in time for the upcoming school year. If other people are helping you with your application—for example, teachers writing letters of recommendation for you—be sure to inform them of the deadlines and give them plenty of notice. Many scholarship applications will have an essay component. You can assume that the other students applying for a particular scholarship also meet the basic requirements (a certain GPA or above, certain demographic criteria, etc. ), so it isn’t enough to just have good grades or be “eligible” for a scholarship. Often it’s the essay that can really set you apart. Take the time to write multiple drafts and have family, friends, or teachers provide feedback.